Hey local businesses, join our team! What I love most about Edmonton is that we are not only a city of people that care, but a city of people that act. When help is needed, it's always there. Over the last 8 years of Free Footie, thousands of people have rallied in support of our 1300 kids to make sure they can get on the field. We know that the opportunity to play, as cliche as it may sound, changes lives. We're told that by parents, coaches and the kids themselves. For many kids, it's the only chance they'll ever have to play on a team. We've tried really hard over the years to fight through the politics and keep the focus on the best interest of the kids. To keep it grassroots, so everyone who volunteers or donates sees their time and money make a direct impact. You can see, watch and meet the kids you help. You can also see them change because of you. Check out our Twitter, Instagram and Facebook for more photos!!! Personally, i really believe our team sponsorship opportunity follows that same grassroots ethos. For $1000 you buy a team. What that means is your money supplies the equipment, transportation and coach training for a whole team of kids! In return, you logo is emblazoned across the chest of the jerseys and you've now got your own team to follow and support! I am writing this blog now because we have just opened up 12 more team sponsorship spots for the summer and we are trying to find those sponsors by June 2 (in 4 days!!). That's because we are expanding our programming this year and adding summer camps! These are open camps for all kids for a paid fee as a fundraiser for a program, but we are also trying to find sponsors to send teams of 10 Free Footie kids to camp! We know that summer can be a really hard time for our kids. A lot of their support systems disappear, including us. Our season follows the school calendar, so we are done at the end of the June. Further, many other summer camps don't provide transportation and we've learned that transportation is the single biggest barrier to participation. So, we've put together a camp throughout July where kids will work with olympians, professional athletes and varsity athletes from MacEwan University. Soccer is the carrot each day, but the focus of the camp is fun, confidence and leadership. We will be build character because we know that instilling a hard work attitude will get kids further than anything else. The Free Footie kids get free transportation to and from the camp as well as a healthy lunch served by Cafe Blackbird. We have an indoor/outdoor venue so we never have to cancel on the kids. The camps run from 8:30-5:00pm in an attempt to help accommodate the work schedule of parents and really keep kids busy. It's ver easy for you to help. All you have to do is click this link and donate. You can donate your $1000 online or by cheque. If a team is too much, join the list of individuals you see on the donation page who are chipping in. We are proud to say some new sponsors, and some existing sponsors, have signed on already to help at our summer camp!! Matrix Hotel is offering up accommodations for our visiting celebrity coach Karina LeBlanc. Karina is the longest serving member of the Canadian Women's National Soccer team and an Olympic bronze medalist. She'll be coaching at our camp. Transcend Coffee is sponsoring another team! 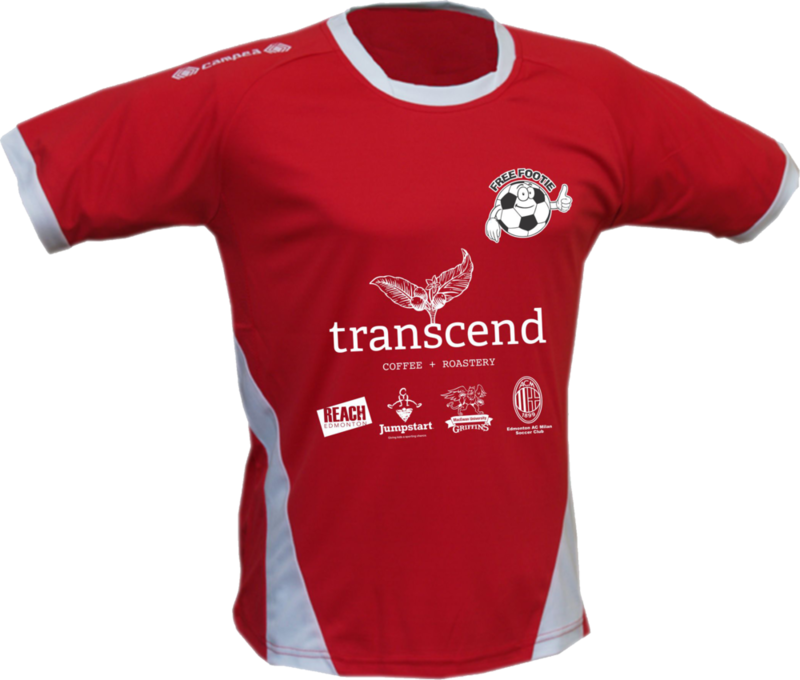 Poul Mark and the Transcend team are sponsoring one of our Free Footie league teams already this year and they are now helping us send a team of 10 kids to summer camp! Thank you for the continued support! Prairie Gold Scaffolding is one of our biggest supporters. They are sponsoring 7 teams this year and have graciously committed to sponsoring 2 Footie Camp teams!! Huge thank to George, Elsa and Gus! The Oil Capital Kiwanis Club is a new Free Footie sponsor this year and the fine folks there have generously committed to sponsoring a Footie Camp team as well! Thank you to Hazel Gillis for her continued support! Dr. Saljae Aurora is generously donating funds to sponsor a team of 10 Free Footie kids to attend the camp. We're proud to bring new sponsor onto the Free Footie team! Lynn Heard, formerly of the Unheardof Restaurant has been a sponsor of Free Footie since it's inception. She sold her business, but that hasn't stop her from supporting the kids. Lynn's mother recently passed away, so a Footie Camp team is being sponsored in her honour. For the last 15 years she was called GG, short for Great Grandma, and was a superhero, so our graphics guy came up with a fitting logo! Reach Edmonton is a huge believer and supporter of Free Footie both financially and with organizational support. We're proud to have the team behind us for Footie Camp!